John C. Dixon - Open Univ. This book provides detailed coverage of the theory and practice of vehicle cornering and handling. 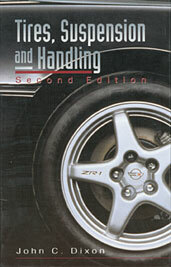 Much of the material in this book is not available elsewhere, including unique information on suspension analysis, understeer/oversteer, bump steer and roll steer, roll centers, limit handling, and aerodynamics. Each chapter ends with a wide selection of problems, providing an ideal review. This book is an excellent resource for vehicle designers and engineering students who want to better understand and analyze the numerous factors affecting vehicle handling. If you do not have access to SAE MOBILUS via username/password or institutional access, you can still purchase the Book, Tires, Suspension and Handling, Second Edition.